Which Advantages Does the CISS Brother MFC-990CW Give to Its Users? Installation of the CISS for Brother MFC-990CW system, as well as that of similar models CISS for Brother MFC-J220 and CISS for Brother DCP-110C, can not either cause any damages inside the printer or need any changes in its design. This procedure is as easy as standard original cartridge replacement, except for one difference: the User has to reliably fix the silicone ink feeding cable onto the printer case with appropriate fasteners and scotch. When installed, this type of equipment will make the print-head's duty cycle longer. The external ink donor tanks bear special openings for convenient ink refill during printing process. By means of silicone multi-channel cable the tanks are interconnected with the corresponding ink cartridges which substitute the original ones exactly on their standard mounting sites. While printing, the ink runs out from the cartridges, which process creates underpressure inside them. The underpressure makes the ink constantly move via the multi-channel cable from the donor tanks to refill the cartridges. This is the way the system provides non-stop ink supply to the print head. The only thing you need is not to forget to add inks to the external donor tanks, which procedure can easily be done without stopping your printer's operation. The CIS Brother MFC-990CW is a kind of supplementary equipment for printing device which provides non-stop ink feeding to the print head from large-capacity external refillable plastic tanks. As a rule, each tank contains at least 80 ml ink. 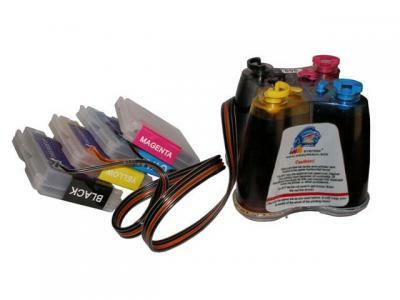 A standard original printer cartridge contains maximum 20 ml ink. In order to replace it with a new one, an operator will have to stop printing. The CISS Brother MFC-990CW ink system, with its 50-100 milliliter capacity, lets the printer work without interruptions. In case any of the inks in the external donor tanks is nearly over, just add it into the proper tank without stopping your printing process. The Users, who had already tried to replace printer cartridges, would like to ask a logic question: "Each disposable cartridge has its own chip with a program key, which accurately controls the ink rest within the cartridge. This is the very reason why you can not refill the cartridge. The chip will never let you do this, because according to its calculation, the ink has already been finished. So, how can the CISS for MFC-990CW pass over this technology?" Conventionally, such continuous ink supply systems use permanent chips, which recover automatically. If the chip insists that the ink is over, just reload the printer and the system will think again that a new disposable cartridge is installed.